Molly's Room: A narrow but comfortable space. Molly’s room features a loft bed equipped with our U-shaped staircase. 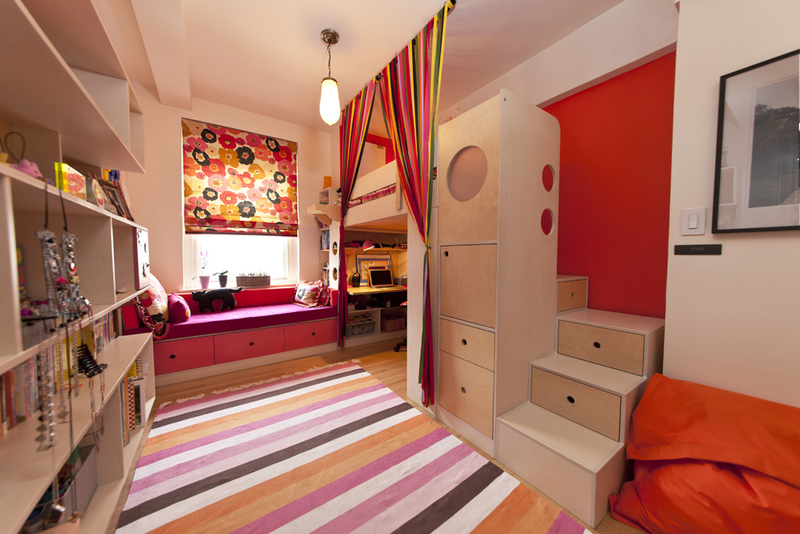 The U-shaped configuration is a major advantage, increasing safety as she climbs up and down, adding to the room’s storage capacity (the stairs double as drawers), as well as making it easy for Molly’s parents to access her bed when it’s time for laundry, bedtime stories or getting cozy. The narrow layout of this room presented us with the challenge of creating much needed space for storage, work and play, while retaining a sense of spaciousness. We achieved this by building along the room’s perimeter and leaving the center space free of obstruction. We also installed a bookcase with an indented profile, which doesn’t block as much light as a standard design. The bookcase is positioned near the entryway and the indentation also serves to ensure that line of sight upon entering the room is not obscured. This loft features a detachable hanging tray that serves as a nightstand. Here, Molly’s parents added their own element, namely multi-colored ribbon attached to the ceiling that adds intimacy and privacy to her bed and work areas, allowing Molly to claim the space as her own. Beneath the window, a storage bench has been strategically placed near Molly’s desk to create a social space in the room. In addition to the desk, we installed a modular shelving unit below the bed that can be removed and repositioned if Molly outgrows her loft. The featured product in this room is a customized version of our Dumbo Loft Bed.